1 mario | This Blog Rules | Why go elsewhere? In the coin-operated, joystick-tugging, button-bashing gaming craze of the 1980s, one particular Nintendo release quickly became a bare necessity in any self-respecting amusement arcade. One of the earliest products of the platform genre, the influential and instantly popular Donkey Kong flaunted a simple concept: Jumpman, later known as Mario, must rescue a damsel in distress from the clutches of a giant ape, all while avoiding the paths of tumbling barrels and flaming fireballs. This setting is the inspiration for an uber-nerdy yet super-cool shelving unit created and built by LA-based designer Igor Chak. 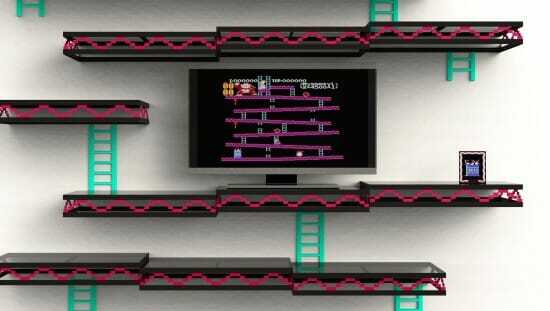 Suitably entitled ‘Donkey Kong Wall,’ this ingeniously retro design is made of carbon fibre, anodized aluminum pixels, stainless steel rods and toughened glass tops. It is capable of supporting up to 60lbs, meaning the streams can be crossed and the more advanced games of today – or yesteryear, if you like – can be played on its sturdy surface.